How imperiled is each species? Conservation organizations have developed systems of ranking how imperiled species are based on varying criteria. 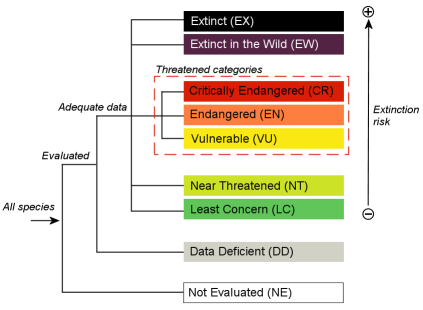 We track some of these systems of conservation status and priority on each species page, especially the categories of the IUCN Red List of Threatened Species. Here are the different categories and levels of conservation status from several international and national organizations. The International Union for the Conservation of Nature (IUCN) system for evaluating the status of a species is used broadly. Below, you can see the categories they use. We ask each author to search the IUCN Web site. Read the full criteria for the categories in the Red List version 3.1 (PDF). If you would like more information please visit the IUCN Red List of Threatened Species. Read more on the specific definitions for each of the categories here. The Convention on International Trade in Endangered Species (CITES) of Wild Fauna and Flora protects species in the international trade. This document prevents the trade of endangered flora and fauna and lists several amphibians. We ask our species account authors to search their Web site. For more information and to search the CITES fauna list, go to CITES Web site. Some amphibians have regional protection. We ask our authors to gather as much local information as possible, and this includes any local or regional protection amphibians might have. For example, to obtain regional status in California, authors consult the California Department of Fish and Wildlife 's Species of Special of Concern (PDF).